The Student Association will host an open mic night Saturday Nov. 15. 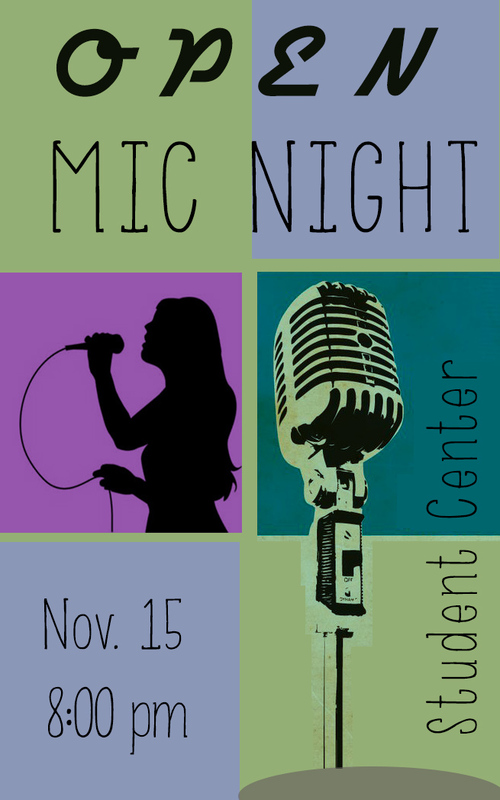 The event will take place at the Student Center at 8 p.m. Students are invited to showcase talents such as singing, poetry reading, and drama performances. Originally, the student association had planned a talent show for this Saturday. “The open mic night is a more casual event. We had intended on having our (Adventist Intercollegiate Association) fundraiser this Saturday, however, now we are planning on raising that money in a different way. The student association is discussing alternative options and we will have everything finalized by next semester,” says Austen Powell, student association president. Refreshments will be provided. Those who do not participate in showcasing a talent are encouraged to eat, join the audience and socialize. “I don’t plan on participating, but I’m definitely going to be there. It’ll be fun to socialize and watch my friends perform,” says Brisa Ramirez, junior communication major. Students are encouraged to contact Ann Jobity, assistant dean of women, if they are planning to participate. Although it is an open mic night, Jobity would like to get an estimate as to how many performances there will be. She can be contacted via email.